Wild populations of Paphiopedilum niveum (Rchb.f.) Stein, an endangered orchid species, have been threatened with extinction due to climate change and overcollection. Conventional methods of propagation are unable to meet market demands. The current study reports the production of genetically stable, protocorm-derived protocorm-like bodies (PLBs) of P. niveum that can be used for commercial production. These PLBs are referred to hereafter as somatic embryos (SEs). Factors affecting SE induction and SE proliferation were examined. The highest percentage of SE formation (68.33 ± 11.77%) and the maximum number of SEs per explant (5.19 ± 0.67) were obtained on modified Vacin and Went (MVW) medium containing 0.1 mg L−1 1-naphthaleneacetic acid (NAA). The highest increase in fresh weight (FW) of proliferated SEs (183.33 ± 28.93 mg per 100 mg initial FW) was gained on hormone-free MVW. These SEs eventually developed into vigorous plantlets after culturing on MVW supplemented with 0.2% (w/v) activated charcoal and 50 g L−1 banana homogenate for 12 wk. A histological study revealed that SEs originated from both the epidermal and the sub-epidermal layers of the original protocorm via direct somatic embryogenesis. The genetic homogeneity between the mother generation (V1; the original protocorm) and subsequent generations (V2 and V3; the primary and secondary somatic embryos, respectively) was shown to be identical via random amplification of polymorphic DNA (RAPD) assessment. All regenerated plants grew well under greenhouse conditions. 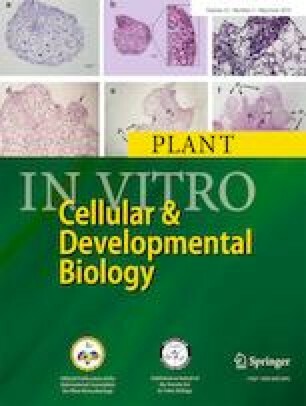 The authors are very grateful to Ms. Nopparat Thawinwathin from the Department of Agriculture Extension, as well as Mr. Ongart Tantawanich, and Mr. Mohammat Nueaoon, for contributing capsules of P. niveum for this study. The authors would like to thank Dr. Natthakorn Woraathasin and members of the molecular genetic laboratory from the Department of Plant Science, Faculty of Natural Resources, Prince of Songkla University, for technical support. Finally, the authors would also like to express their gratitude to Ms. Lily Chen who supported the manuscript preparation. All authors have made considerable and substantial contributions to the present research and the manuscript and have approved the publication. The authors are grateful to the Graduate School of Prince of Songkla University, for making this study possible through a Graduate Scholarship grant (95000201) and research fund to SS.